The Community Foundation and the R.E.B. Foundation recognized five Chesterfield County teachers with 2018 R.E.B. Awards for Teaching Excellence during a regional ceremony last week. 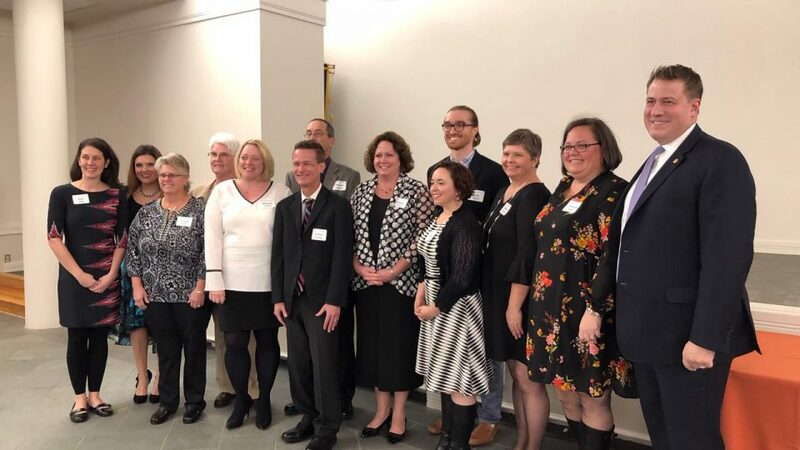 Seven other Chesterfield County teachers were recognized as finalists for the award. Together, these 12 Chesterfield County teachers will receive $60,000 in professional development grants. The educators were part of nearly 35 outstanding public school teachers from across the region selected as honorees. The awards program, a partnership between The Community Foundation and the R.E.B. Foundation, recognizes excellence in public education by awarding cash grants to outstanding public school teachers from the city of Richmond, the counties of Chesterfield, Henrico and Hanover, and the Department of Correctional Education. Since its inception in 1988, the program has awarded $3.5 million to more than 800 public school instructors as recognition for their outstanding classroom performance. She will use her award to expand her knowledge and experiences in outdoor and underwater exploration activities related to the physical education curriculum and outdoor initiative, through training and traveling to Alaska and Florida. She will assess real world access for people with disabilities in outdoor adventure activities, including biking, fishing, nature exploration, scuba diving, snorkeling, and environmental adventures. She plans to explore the cultural landscapes of New York City and Jerusalem, two world cities that have shaped the past but continue to shape the future of both regional and global decision making. She plans to bring this field work back to both her AP Human Geography and AP World classes and share it at both national and regional conferences on how to incorporate field work into the geography and history class. Laura will attend a one week comedy improv intensive in Chicago, then travel to Ireland and the Netherlands to learn about the culture and musical styles performed there. She will finish by completing two courses at VCU to complete her Orff certification. She will explore the ancient culture, cuisine, archaeology, and theater in Athens and Santorini, Greece with a focus on bringing the community and hospitality back to the classroom, county, and nation. will use the REB grant to retrace the footsteps of my grandmother who was born in Romania, a nurse in Dresden, a refugee, and American immigrant. Traveling to Canada and Europe will provide opportunities to experience the route of her adventurous soul and grant me a greater global awareness that will surpass average research. As she connects students with opportunities that involve them in their learning, she will use lessons gained to broaden their social and academic awareness.